Do You Know About Fracture of the Neck of Talus? Fracture of the neck of talus is the result of a severe dorsiflexion injury. This may develop from sudden severe violence of the driver’s foot against the footboard in an automobile accident. Several types of fractures may be produced. Undisplaced fracture of the neck. Fracture neck with dislocation of talocalcanean joint. X-ray: Radiological appearance establishes the nature of fracture and presence of any dislocation of the talocalcanean joint. Undisplaced fracture: Undisplaced fracture does not require any manipulation. A short leg plaster with the ankle-joint in plantar-flexion for a period of 6 weeks is all that is required. Displaced fracture: Manipulation is done under general anaesthesia. The foot is placed in a state of forced plantar-flexion and eversion. Plaster immobilization: Below-knee short leg plaster is applied with the foot in a plantar-flexed position. After 6 weeks when the plaster is removed, graduated exercise of the ankle is advocated. Operative fixation: Open reduction and fixation may be necessary in case of closed reduction. Orthopedic screw is passed from the head of talus to the body and the fracture is fixed. This is a rare and serious injury. 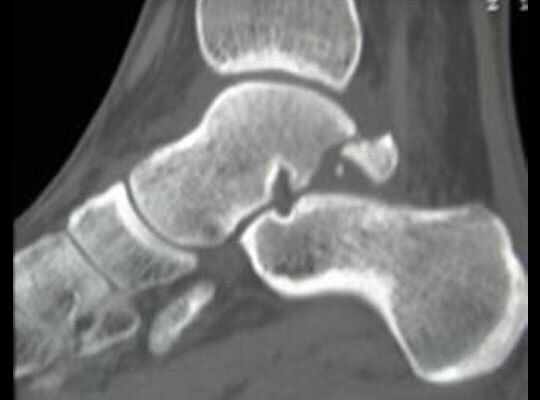 The fracture dislocation is difficult to reduce and avascular necrosis of the body of talus is common. The lesion develops following severe dorsi-flexion injury of the ankle-joint. The body of talus is separated from the neck and is displaced posteriorly towards the medial side. There may be complete rotation of the body of talus and the posterior tibial vessels are likely to be compressed. The displaced body produces swelling on the medial side of the ankle-joint. The skin over the swelling is stretched. Excessive tension may interfere with the local blood supply of the skin and can lead to necrosis. (1) Closed reduction: Success may be achieved by closed manipulation. The joint space between the tibia and calcaneum is made to increase by applying skeletal traction through the calcaneum. Attempt is then made to reduce the displaced body of the talus into its normal position by the application of pressure. Plaster immobilization: Below-knee plaster is applied and is maintained for a period of 10-12 weeks. X-rays at intervals are essential to see any evidence of avascular necrosis of talus, characterized by increased density of the bone. (2) Open reduction: Operative intervention is probably the best procedure but is often difficult to perform. Posterior tibial vessels and nerves are occasionally stretched by the talus and are likely to be injured during surgery. Different ortho implants are used in the surgery, which can be accessible from the orthopaedic implants manufacturers.